Are you looking for a bible study for your sons? Doorposts has a new study out called Because You Are Strong which is a in-depth look a “godly strength” and teaches children bible study skills to help them have a lifetime of successful independent bible study. Because You Are Strong includes ten studies, each adding to the one before it. This book contains 74 days of study which will teach your child many skills, such as using a topical bible, studying words and their original Hebrew, and using a concordance. Along with the 74 days of study and detailed questions in workbook format, there are 40 additional topics of suggested study for your child. There is enough material here for a full year of bible study with your children. I am really impressed with the sequential nature of Because You Are Strong. The guide builds on itself, teaching your child incrementally how to study. For example, the first study is simply a devotional study- reading assignments are given, then the child thinks on them, and then applies them to their life. In the second study, you child now is studying a topic across multiple readings. Not only do they read and apply, they also learn to use a topical bible. By the fifth study, your child is learning to use a concordance, and is looking up words in their original Hebrew. This study teaches many skills at once and really will help your child think critically and gain a bigger picture view of the verses they are studying, the history behind them, as well as apply them to their own lives. 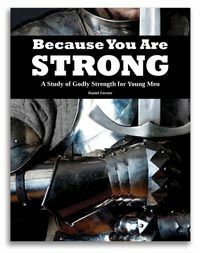 This bible study was written for boys 10-12 and older, and focuses on teaching them a biblical understanding of strength, and how to use that strength with wisdom. While written for boys, it can also be used with girls, and includes questions that can be substituted to facilitate conversations with both sexes. Scriptures quoted are from the KJV and the ESV translations. This study will have your sons looking more in-depth at bible heros, doing word studies, and finding their own strength. You can read crew reviews from families who used both this study for boys, and the Beauty in the Heart bible study for young ladies. Head on over to the crew blog to read their reviews by clicking the banner below. Purchasing Information:Because You Are Strong retails for $14.00 for the softcover edition, and $10.00 for the ebook.